Two new exhibits coming to the museum this summer are focused on the Khmer Rouge, but members of CAI are more concerned about conserving their ancestral country’s extensive cultural history. Carolina Sanchez Kompha Seth stands in front of the Killing Fields Memorial at the Cambodian Association of Illinois’s National Cambodian Heritage Museum. As a young Buddhist monk in Phnom Penh, the capital of Cambodia, during the 1960s, Kompha Seth studied the Brahmi alphabet and Magadhi—a root language of modern Khmer—which had been preserved and passed down for generations. Today, he's one of only a few Cambodians in the world who understands these dialects and their links to modern Khmer. Seth was fortunate enough to quickly obtain a sponsorship from Catholic Charities, and in 1975 he arrived at Camp Pendleton in California with just one bag of luggage, then moved to Downers Grove three months afterward. He'd later learn that 24 of the 25 members of his family were killed by the Khmer Rouge (his sister-in-law survived). Seth does not know for sure how they all died. His sister-in-law told him that some expired from starvation and diseases due to Khmer Rouge policies (such as closing hospitals and rationing food), while others were executed. "Cambodians lost so much in the genocide," says Seth, now 74. "They lost their soul." In 1976, Seth cofounded the Cambodian Association of Illinois, where he serves as executive director. Under his guidance, the association is moving away from its early mission of providing refugee-adjustment services—job placement, English-language instruction—to focus on renewing and teaching a culture that was nearly destroyed by the Khmer Rouge. This year, CAI's National Cambodian Heritage Museum will mount two exhibits in an effort to both preserve the stories of Cambodian refugees and envision the future of both native Cambodians and Cambodian-Americans. On June 5, the Documentation Center of Cambodia will bring to the museum the traveling show "The Forced Transfer," which draws on DC-Cam's vast archives of articles related to the Khmer Rouge atrocities. At some point in the late summer or early fall, the museum will host photographer Pete Pins's "Migration of Memory," which portrays members of the Cambodian diaspora alongside pregenocide photographs and mementos. On a recent Wednesday morning at Seth's CAI office in Lincoln Square, it was clear that the horrors of the Cambodian genocide still weigh heavily on him. But as CAI celebrates its 40th anniversary this month, his mind is on what lies ahead. "To survive," Seth says, "we need to remember the past and then transmit it to the younger generation." 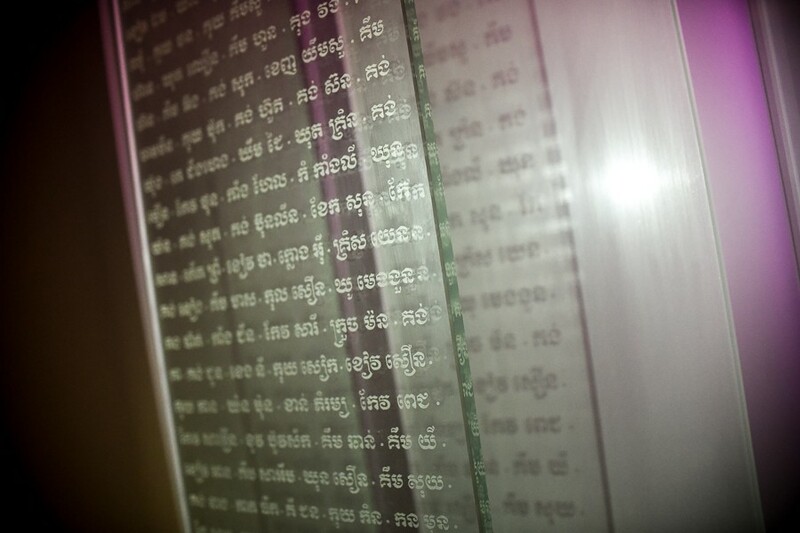 At the National Cambodian Heritage Museum, each six-foot-tall glass panel of the Killing Fields Memorial represents 25,000 Cambodians killed during the Khmer Rouge genocide. The Khmer Rouge ruled Cambodia between 1975 and '79. During that time they imposed radical social-engineering policies in order to turn the country into a classless society. The communist insurgents forced the urban populations of Phnom Penh into the countryside and made them work long days on agricultural communes. They burned books, banned money and religion, and closed hospitals and schools. They killed anyone they considered "intellectuals," from academics and artists to people who simply wore glasses. Yale University's Cambodian Genocide Program estimates that under the Khmer Rouge's governance 1.7 million people were executed or died from starvation or medical neglect. The destruction extended to Cambodian culture, affecting more than 4,000 years' worth of art. The Pol Pot-led Khmer Rouge government killed 80 to 90 percent of classical dancers and singers, according to ethnomusicologist Sam-Ang Sam's book Cambodian Culture Since 1975: Homeland and Exile. 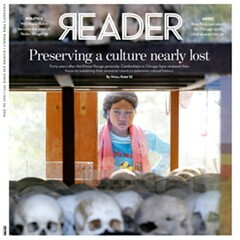 Of the 380,000 artists and intellectuals present in Cambodia before the Khmer Rouge, only 300 survived the regime, according to one estimate cited by Sam. Out of this monstrousness, CAI first took shape. It was founded on May 30, 1976, by Seth and two other refugees, Khoun Lorn and Prak Sunay. (Sunay was president, Seth vice president, and Lorn served as secretary.) The group was first incorporated as a chapter of the Cambodian Association of America, a national organization based in southern California. 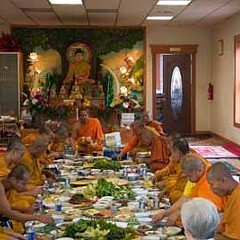 The Illinois group initially had no office; they met in the homes of Cambodians in Chicago and in the western suburbs. They helped new transplants connect with more established Cambodian immigrants and sponsored refugees. Seth says he personally backed 30 refugee families, partially with money he made working as a corrections officer at the Joliet Correctional Center. CAI set up its first office in 1980 on the second floor of a building at 1105 W. Lawrence, across the street from the Aragon Ballroom. In its new space, the group began offering a wide range of services to help refugees acclimate to Chicago. "In the beginning," Seth says, "it was about learning the language and providing adjustment services—how to learn the new culture and food." Even mundane tasks like grocery shopping could be a challenge to newcomers used to open-air markets or refugee-camp rations. Seth remembers getting late-night calls in those early years from people who needed blankets or help turning on the heat in their apartments during frigid Chicago winters. By 1983 CAI had grown to the point where the staff believed it was time to break off from CAA and establish a separate organization. Anneth Houy, 34, has fond memories of CAI's first office on Lawrence. She came to Chicago in December 1989 with her parents and eight siblings from the Khao-I-Dang refugee camp in Thailand, where she was born. Houy's parents and older siblings fled the Khmer Rouge in 1979 and had waited almost a decade for government approval to come to the U.S. When they finally arrived, Houy's family had trouble adjusting. While there were a growing number of Cambodians living alongside them in Uptown, the neighborhood was vastly different from the farming community they had left in Battambang Province in western Cambodia. CAI's office provided the family emotional support and instruction for navigating life in America—but more importantly, it gave them a home away from home. "You come here and everyone speaks the same language and eats the same kind of food, which is a big part of who we are," Houy says. "To have a sense of belonging within the community here was great." In addition to adjustment services, CAI started teaching Cambodian dance and Khmer language classes at the new office. Though many Cambodian refugees in Chicago were struggling financially, Seth and CAI's other leaders felt that preserving and promoting their culture was an equally important pursuit for their office. And since the Khmer Rouge targeted artists in particular, the group understood that Cambodian culture was in danger of disappearing altogether. In 1998, the association bought their current building at 2831 W. Lawrence. Two years later, CAI launched its Campaign for Hope and Renewal and raised more than a million dollars to renovate and expand the facilities. They completed construction in 2004 and opened the National Cambodian Heritage Museum on the building's first floor. The new heritage museum marked a turning point for CAI as a social-services agency. 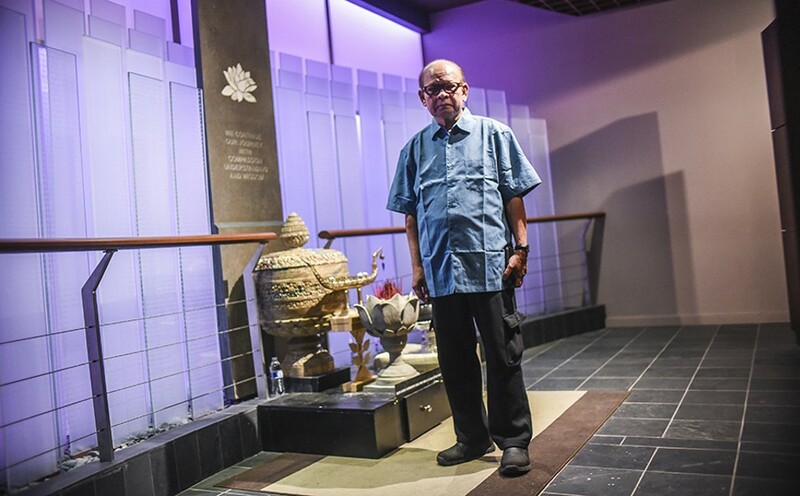 It provided a permanent home for Cambodian culture in Chicago and a way to educate both younger Cambodians and the general public about the Khmer Rouge genocide. That education begins at the museum entrance on Lawrence Avenue, where a two-story bas relief in classical Cambodian style is positioned on the right side of the doorway. Engraved vertically on the stone are two figures: a four-sided head and Apsara, a female spirit who signifies beauty and gentleness. The four sides of the face that sits above Apsara represent love, kindness, appreciation, and equanimity. Inside, visitors can view the museum's permanent exhibit, "Remembering the Killing Fields," which opened in fall 2011. It illustrates life under the Khmer Rouge and includes the stories of survivors living in the Chicago area. The brutal realities of the "killing fields," where the Khmer Rouge executed and buried more than a million people, are described in detail. CAI associate director Kaoru Watanabe, 59, says the exhibit has sparked "intergenerational dialogue" within the Cambodian community in Chicago, especially between older refugees and their children, many of whom were born in the U.S.
"Many people still don't talk about life during the genocide," Watanabe says. "So the exhibit provided an environment in which survivors could tell their stories using images and artifacts from Cambodia." "Remembering the Killing Fields" also inspired then-governor Pat Quinn to designate an annual Cambodian Day of Remembrance in Illinois, the first state in the country to do so. On the first Saturday in April, residents are encouraged to join the Cambodian-American community in remembering the Cambodian genocide. The Killing Fields Memorial, housed in a dark room on the north side of the museum, is the nation's only monument for victims of the Khmer Rouge genocide. (Earlier this month, the city council of Long Beach, California, approved plans to create a second monument.) The Cambodian Heritage Museum memorial consists of 80 six-foot-tall rectangular glass panels arranged in four rows along a wall, backlit with subtle purple light. Each panel represents 25,000 Cambodians killed during the Khmer Rouge genocide. Delicately etched on the glass are the names of victims, all of whom are family members and friends of Cambodian refugees living in Chicago and elsewhere in the U.S. The centerpiece of the memorial is a hulking black stone pillar, which mirrors the shape of the glass panels. 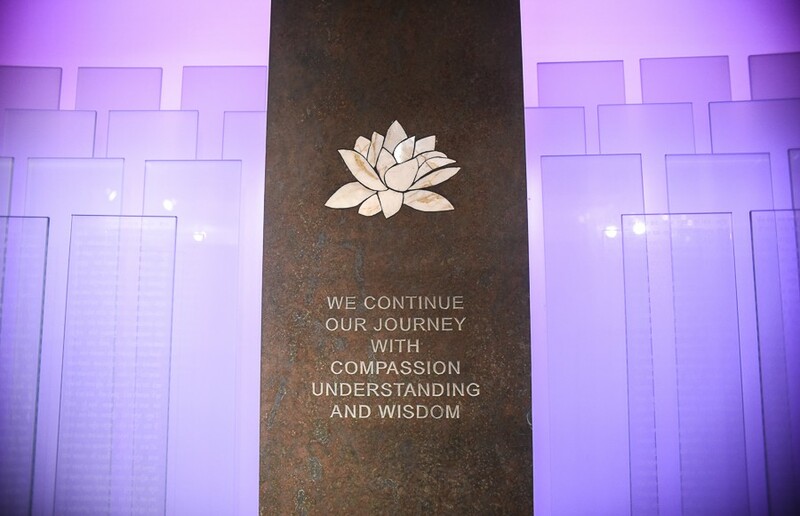 Etched on the pillar is a white lotus and, beneath it, the words: we continue our journey with compassion understanding and wisdom. On the floor above the museum, CAI's staff is working on helping the Cambodian community in Chicago take the next step in that journey. The back wall of Seth's office is covered in photocopies of ancient Cambodian texts. The passages were inscribed on temples built roughly 1,000 years ago, he says, during the time of the Khmer Empire, which spanned Southeast Asia and was responsible for the construction of the Angkor Wat temple complex. Seth had studied the texts in the 1960s but had forgotten about them until around seven years ago, when he recalled them in a dream. When he rediscovered them, he thought of his teachers, a pair of monks whom the Khmer Rouge killed along with most other religious leaders and scholars. Seth wondered if any other Cambodians were left who could understand the ancient scripts in which the texts were written. Last December, after finding no one in the U.S. to assist, he returned to Cambodia for the first time since fleeing four decades before to meet with academics at the Royal University of Phnom Penh. To his surprise, none of them could interpret the scripts. Upon his return to the U.S., he put together a small exhibit of the ancient texts that he's been displaying to Cambodian community organizations across the country as a means of talking about the forgotten languages of the Khmer Empire. The texts connect Cambodian-Americans to their ancestors, Seth says, and help bridge a growing generational gap between native Cambodians and Americans with Cambodian ancestry. "Right now the Cambodian soul is broken," he says. "The old people say, 'No, I don't want to be American, I want to be Cambodian.' And the young people say, 'No, I want to be American, I don't want to be Cambodian.' 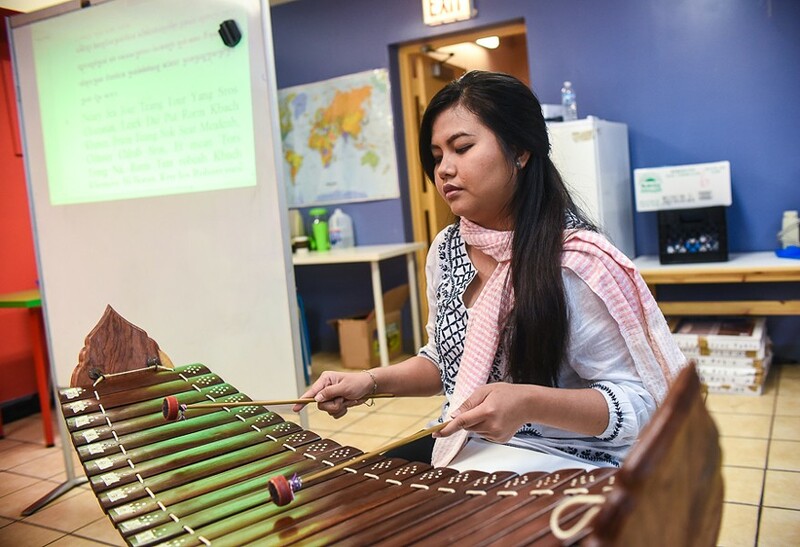 "
Punisa Pov leads a class at CAI while playing the roneat ek, a xylophone used in Khmer classical music. Houy understands that divide well. After attending dance classes and refugee-resettlement programs at CAI as a child, she now runs CAI's Youth Program as well as its Culture and Healing Arts Program. She oversees three music classes and two dance classes a week, in addition to regular after-school activities and camps for kids. Houy says CAI's youth are seeking their place in the Cambodian-American community—and they're trying to reckon with a history that's often very grim. "When you talk about Cambodia," she says, "everyone always talks about the genocide." And while remembering the genocide is important, she says, it can sometimes overshadow the country's rich cultural tradition. "So when I connect with the youth, I try to find a balance with the creative and the positive." It's not always easy to get young Cambodian-Americans interested in traditional Cambodian music and dance, she says, especially when their peers are listening to Taylor Swift and Jay Z. But Houy is convinced the classes are critical for the students. "The older generations are getting old and I think that torch has to be passed on to the younger generation." Houy cofounded the Khmer Support Giving Circle in 2014. The peer-support group housed at CAI helps young people understand their identities and provides financial assistance and volunteers for the local Cambodian community. State comptroller Leslie Geissler Munger bestowed the organization the John Vietnam Nguyen Asian American Youth Leadership Award earlier this month in recognition of their work. 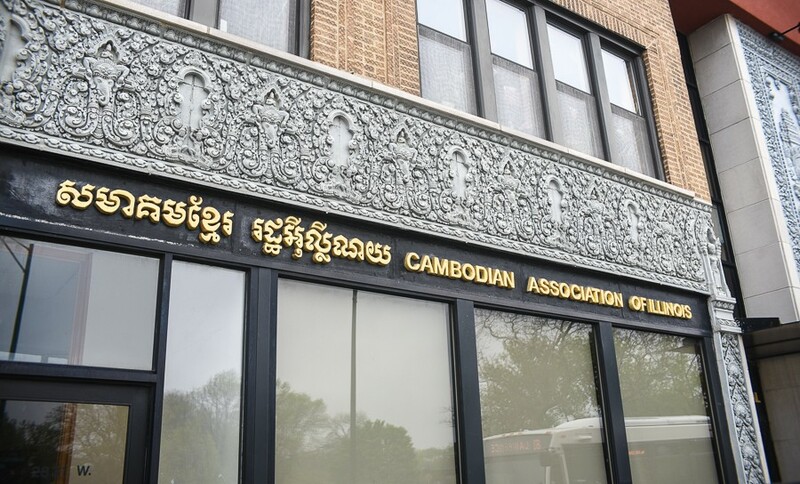 Groups like the Giving Circle give Houy hope that CAI will be able to support the Cambodian community in the Chicago area for another 40 years—with cultural preservation and renewal being an integral part of the association's work in the decades to come. With no Cambodian restaurants in Chicago, the festival of Pchum Ben offers a rare chance to try Khmer cuisine. A new collection in Chicago shows there's more to Cambodian culture than the Killing Fields. 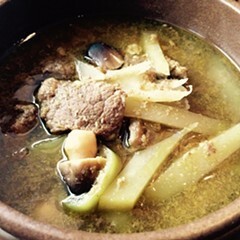 Nil Samorn can't go home again. He's an American now, for better and worse.